The campsite was on the top of a hill giving a great view, it would however have been a bit bleak if the weather was poor. Friday the 12th was a fine day, I had planned on arriving at the Blacksmith’s Arms in Kirkheaton in mid afternoon to lend Jim Hacking a hand in getting things set up but that was not to be! I finally left home after packing a large portion of the Club’s unsorted car and scooter spares around five pm. I was pleasantly surprised that the traffic on the motorway kept moving it was not until I left the M62 at junction 25 that I hit standing traffic. The next three miles to the campsite took over half an hour, giving me plenty of time to follow the map and direction which Jim had sent out. When I finally arrived there were several cars and camping units already established but there was still a fairly flat area to park my camper. 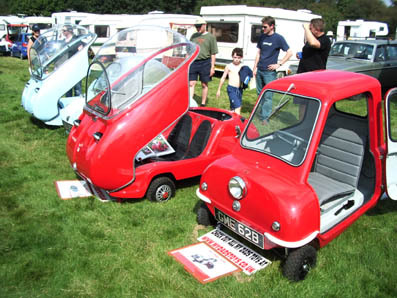 The distance prize, if there had been one, would have had to have been shared by Steve Vine and his girlfriend who had towed his Messerschmitt from Southampton and Grant Kearney who had driven his Scootercar all the way from Scotland! 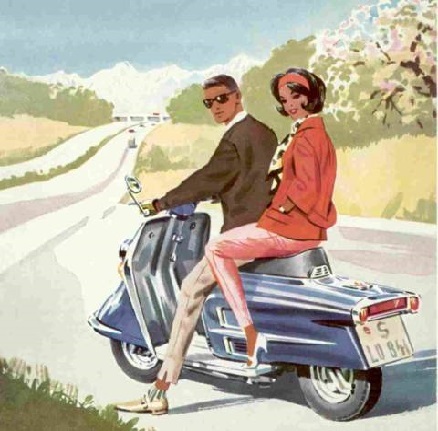 After exchanging greetings there was just time to unload my Trojan in preparation for the run to Miller Oils. 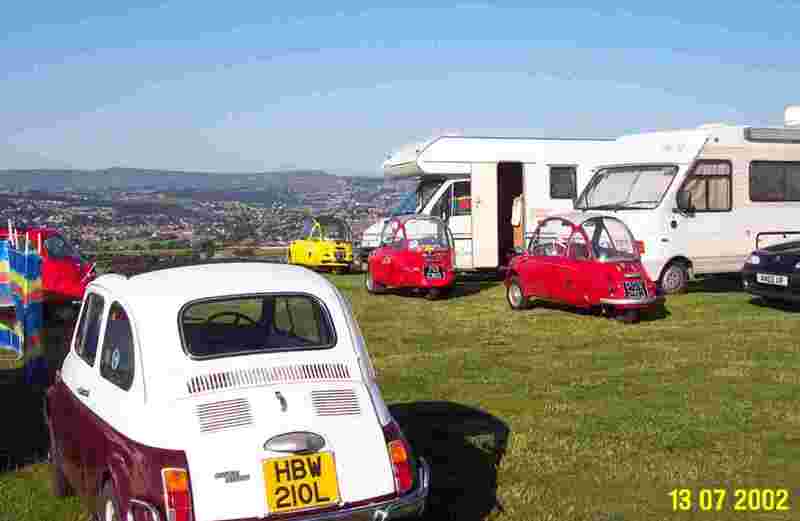 The convoy of fourteen cars left the campsite and arrived at Miller Oils at the appointed time of half past seven. On the journey we appeared to have been going down hill all the way! Some were concerned about their cars ability to get back up them. But Jim had a plan. After being served with drinks there was a brief presentation by on oils by Mike Fenton. This was followed by a tour of the works. I was surprised at how simple the operation of blending oil was. Basically they use a larger version of the domestic blender, into this the base oil and additives are put, its then stirred gently and brought to the correct temperature. Before being piped to the storage area samples are taken and are checked in the lab. Miller’s have been established for well over a hundred years providing a large range of specialist oils and greases, some are manufactured in quite small batches using the original equipment which is operated by hand. After the tour we were treated to a buffet supper and a further short presentation that was followed by a question and answer session. This I think was the most valuable part of the evening for the microcarists present. I am now confident what oil and fuel to use in my Trojan. (See August’s Newsletter & the letter from Miller Oils). It was well past ten when we finally left Miller’s. They had done us proud. At this point my car took the opportunity to misbehave. Jim Hacking had devised a return route, which omitted some of the rather steep hills we had descended on the way there. 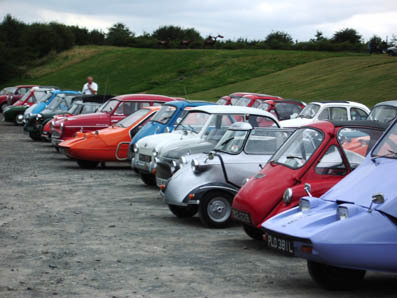 But by the time I got going there were only a few cars left and they decided to follow me! A bad move! Nick Haddon, who was my passenger, and I decided it would be best to return by the same route as we had come, as we had misplaced Jims directions. Unfortunately we missed a turn and got lost. After studying the map we eventually managed to get back to the Blacksmith’s arms in time for a last pint. It was a very pleasant clear night so several of us spent a hour or so chatting and admiring the night skies over Cleckuddersfax. (Cleckheaton, Huddersfield and Halifax to non-Yorkshire folk). 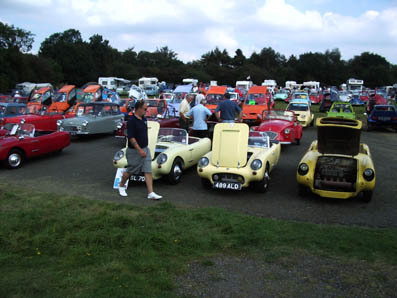 Saturday morning was bright and sunny and there was time for people to check out the Club’s spares. Ted Miller had brought a selection of spares from Garry’s stock, Nick was there with his stock of new spares, Mark had the full range of regalia and I had brought some of the unsorted car and scooter spares. 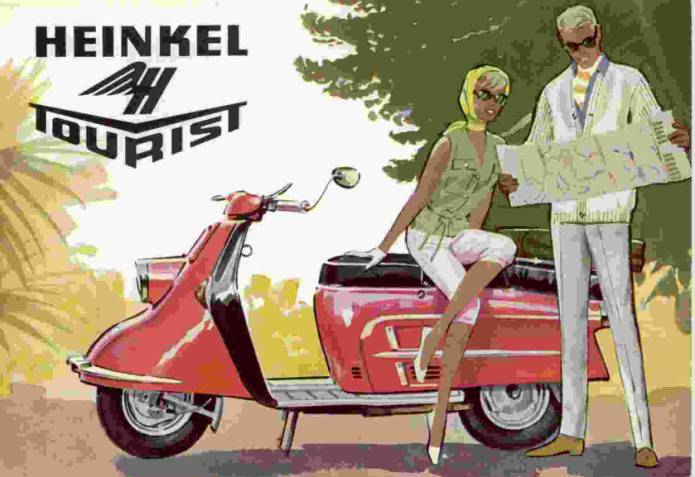 As there were relatively few people present who had Heinkel Trojans I wandered it it was worthwhile even unpacking the spares, but I was surprised by the interest shown and sales over the weekend matched those achieved at previous National Rallies. 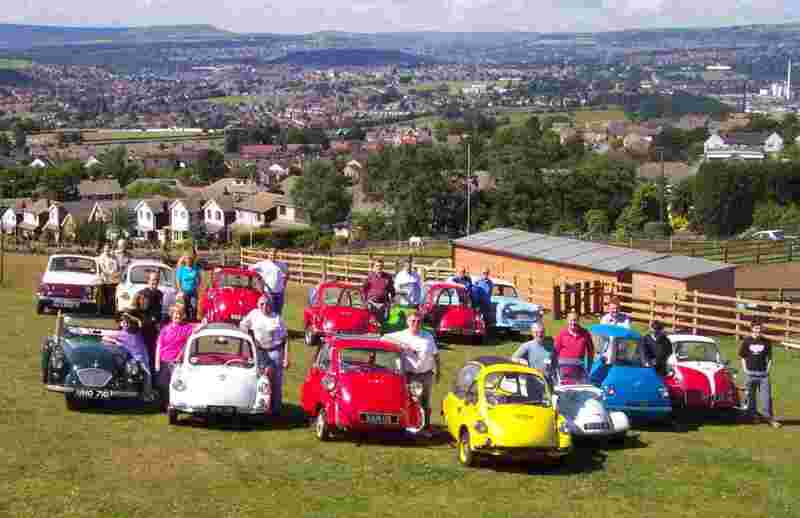 At eleven o’clock Peter Jones and Jim were busy getting the cars lined up for the photo call. Jim had arranged for the local press to attend. Jim’s motor home made an ideal platform for photographs as can be seen from the one on the back of this magazine. Then it was time to line up for the six-mile run to the National Mining Museum. 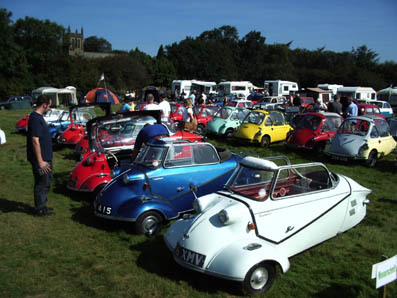 Jim and Janet led the procession in their recently restored Messerschmitt, as the Heinkel is still being restored. 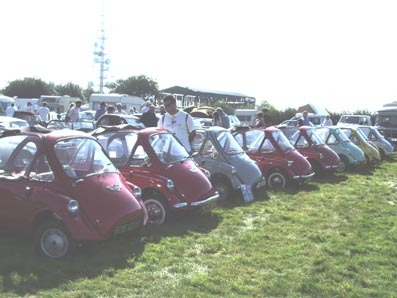 They were followed by two Club members who were driving Isettas! 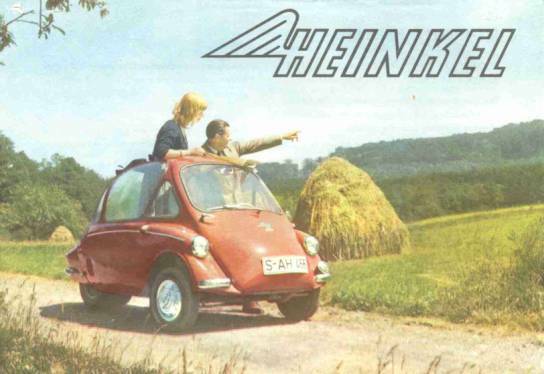 So you have to look very closely at the photograph, which appeared in the local newspapers to see a Heinkel or Trojan! Unfortunately Peter’s yellow Trojan did not make it out of the car park. He and Nick abandoned it and followed in Nick’s Citroen. Jim had negotiated free entry to the Museum for us. This included the underground tour for which we were kitted up with helmet and lamp. It was then five hundred feet down the shaft to have the various coal mining techniques through the last one hundred and fifty years explained to us. There was also a wide range of well present exhibits on the surface. Many improvements have been made to the museum since I last visited it a few years ago and I can recommend it as a day out for any family who has an interest in our industrial heritage. 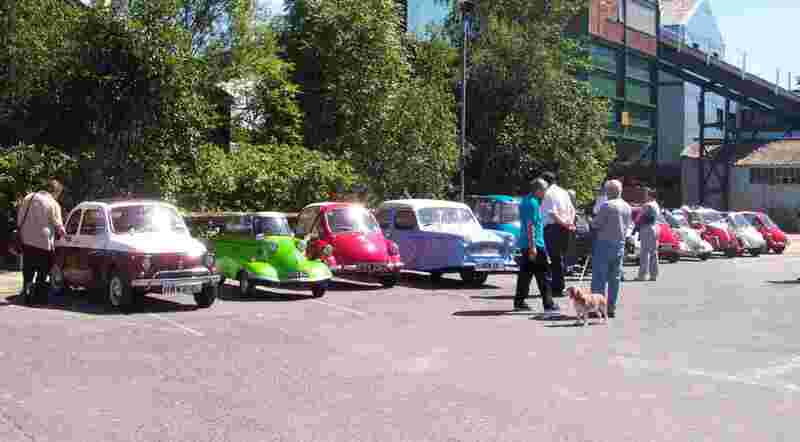 After a late lunch it was back in our cars for the short run to the Skopos Car Collection. 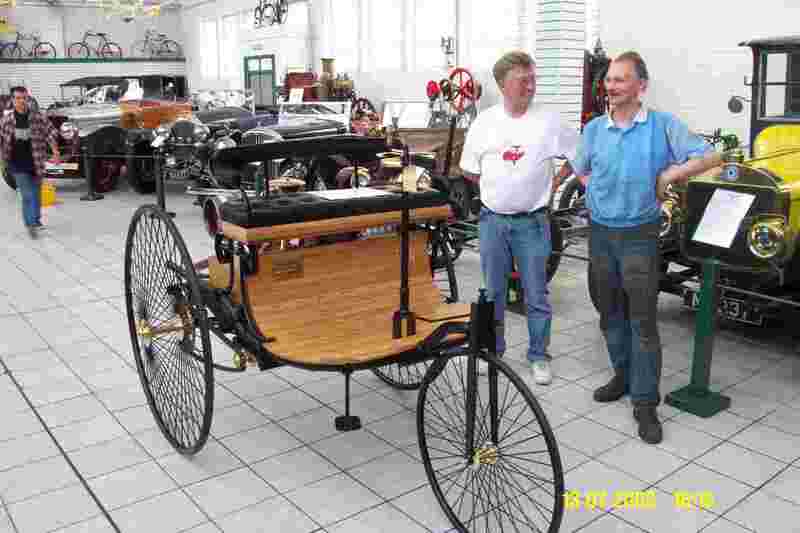 After a cup of coffee and a quick look around some chose to visit the local markets while those who remained were treated to an explanation of the workings of the replica 1886 Benz which are being manufactured in part of the museum buildings. 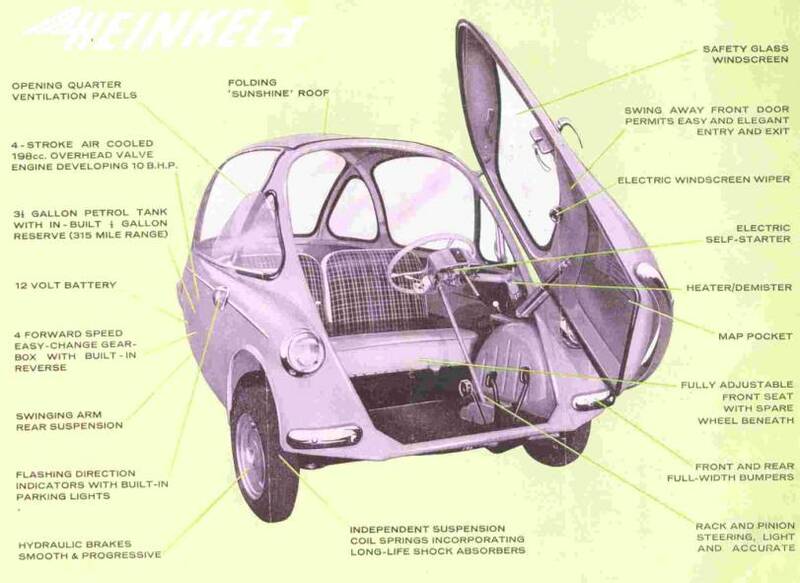 The car was the first attempt by Benz to attach his stationery gas engine to a vehicle. Around one hundred of the replicas have been made and more are planned. Mercedes Benz are buying them for display in their showrooms around the world. Unfortunately, even though the vehicle was a runner, we were not able to see it driven. The excuse was that it had only just been cleaned from the morning run. We were then treated to an amusing and sometimes-irreverent talk on the vehicles in the collection, which included estimated valuations. Personally I find vehicle museums rather boring because you are not allowed to drive dismantle or even touch the exhibits but the presentations by the museum staff made a very enjoyable and entertaining afternoon. It was then back to the campsite. By now the convoy drills were working well and all the cars arrived safely back at the Blacksmith’s Arms in a group. 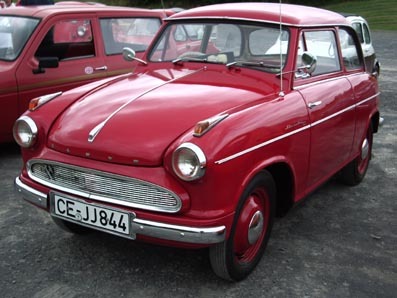 A quick look at Peter’s car showed that no petrol was getting through to the carb, it later transpired that he had not run out but that there was so much silt in the tank that the reserve petrol pipe was completely blocked by it. We managed to get it going by putting more petrol in and cleaning the carburettor. 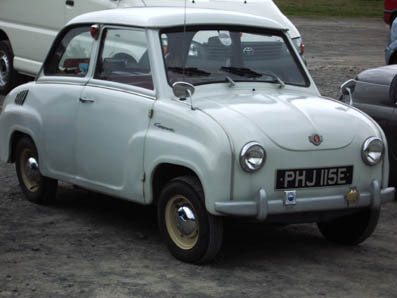 Jim had spent quite a lot of time putting together a quiz, which had a section on rock and roll, and one on identifying microcar parts which had been photographed from unusual angles. However, as the pub was quite busy, we never got together as a group to do the quiz so Jim only got four sets of answers. 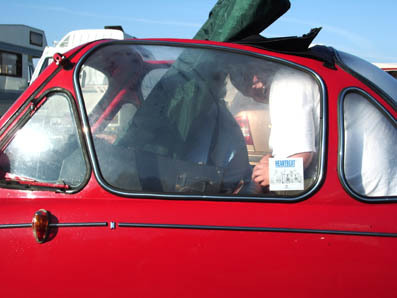 Sunday morning saw Peter Jones and myself preparing for the AGM while Nick Haddon and Ted Miller went to collect his spare engine on it’s rig for the afternoon demonstrations, that was once we had managed to get Nick’s Citroen running, his camping fridge had flattened the battery. Ten thirty saw members and guests filing through the backdoor of the pub for tea and coffee and the AGM. 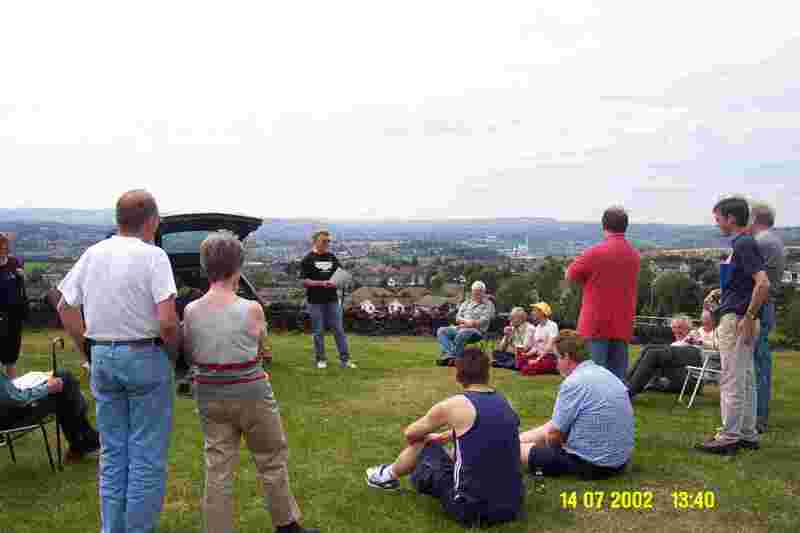 Around twenty members were represented which at ten per cent of membership was a good turnout several members having driven a long way to attend. After lunch Jim announced the results of the quiz and as it turned out there was a prize for each contestant! Then followed a discussion on the new spares being developed for the Club by Nick and suggested methods of fitting them. Paul Thorpe, one of the founding members of the Club, who has recently rejoined was able to lend his knowledge to the discussion of engine charging and fault finding, as I had forgotten my tray of prompts and notes. It was then time to pack up and head for home after a very well organised and enjoyable weekend. All agreed that the problem for Jim was how to improve on the event for next year! I arrived late on Friday night to find the site was already filling well. 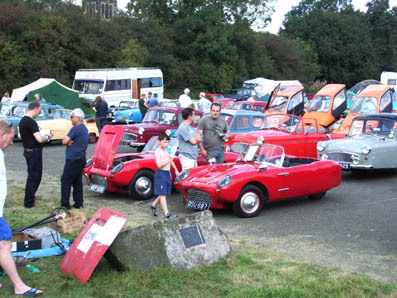 The site was advertised as being back to basics, but it didn’t seem to have put off many, for with the light of Saturday morning, it was clear that we were in for a hot spell of weather, and a good turnout of cars and their owners. The run on Saturday of almost 60 miles was well thought out, with small groups doing the circuit, instead of the more usual start stop of a large convoy. The directions were written in a simple series of drawings, which I found easy to follow even without a passenger. Saturday evening was spent with friends new and old, with entertainment being provided in the on site club room. Sunday the cars were lined up in their respective places, with more day visitors arriving. The site was very full, but all managed to get in . 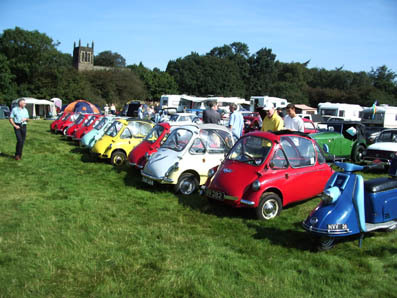 The collection of vehicles was impressive, with a good variety of different machines. There was also a good selection of autojumble, which allowed most of us to get our hands oily, and purchase that illusive part. The weather was superb, hard to complain that it’s too hot in this country, the ice-cream seller wasn’t complaining anyway.